Leigh Hunt was the son of a lawyer from Philadelphia who had settled in London, forced by his sympathy for Britain during the War of Independence. In England he became a preacher and a teacher. He was educated at Christ's Hospital. He wasn't able to enter university because of a temporary speeach impediment. He started writing poems ("Juvenila", 1801) and articles for newspapers. After working as a clerk at the War Office he became editor of The Examiner in 1808. The Examiner was founded by his brother John Hunt. In 1813 an attack on the Prince Regent was published in The Examiner. This resulted in a prison sentence of two years for both of them. In Surrey Gaol he was visited by John Moore, Lord Byron and Lord Brougham. In 1816 he published "Story of Rimini", a very influencial volume of poetry. Several other titles followed and he was surrounded by people like Shelley, Keats, Hazzlitt and Lamb. It was Hunt who introduced Keats to Shelley. Hunt was married to Marianne Kent and they had six children. His financial management was disastrous and after Shelley left for Italy in 1818 (and gave him no longer money) things worsened. Hunt and Shelley persuaded Byron to start a liberal magazine in Italy and in November 1821 Hunt and his family sailed for Italy. Hunt didn't arrive until July 1822. But a few weeks later Shelley drowned and the new magazine The Liberator was doomed from the start. Hunt moved in with Byron. The latter was shocked by the behaviour of the Hunt children, who enjoyed a free education and were hardly ever corrected by their parents, whatever they did. In 1823 Byron left for Greece, where he died in 1824. Hunt stayed in Genoa until 1825. In 1828 he published "Lord Byron and some of his Contemporaries". His corrective descriptions shocked the public, that considered it grossly indecent to write such a book for someone who had profited from Byron's funds. Hunt was thoroughly satirized by Thomas Moore. A period of poverty and illness followed, until he started writing for the Edinburgh Review. In 1844 Mary Shelley saw to it that he received an annuity from Percy Florence, Shelley's son, who had succeeded to the family estate. In 1847 a state pension was added and his worst financial troubles were over. He continued writing and published a comprehensive autobiography in 1850. 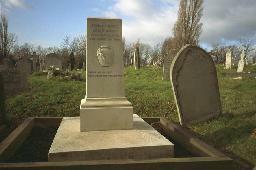 Leigh Hunt died in 1859 and was buried at Kensal Green Cemetery, London. His monument was erected by public subscription. Unfortunately, a (replica) bust by Joseph Durham from 1869 was stolen. "The first time I saw Lord Byron, he was rehearsng the part of Leander, under the auspices of Mr. Jackson, the prize-fighter. It was in the river Thames, before his first visit to Greece. There used to be a bathing-machine stationed on the eastern side of Westminster Bridge; and I had been bathing, and was standing on this machine adjusting my clothes, when I noticed a repectable-looking manly person, who was eying something at a distance. This was Mr. Jackson waiting for his pupil. The latter was swimming for somebody for a wager. I forgot what his tutor said of him; but he spoke in terms of praise. I saw nothing in Lord Byron at that time, but a young man who, like myself, had written a bad volume of poems; and though I had a sympathy with him on this account, and more respect for his rank than I was willing to suppose, my sympathy was not an agreeable one; so, contenting myself with seeing his lordship's head bop up and down in the water, like a buoy, I came away. Lord Byron, when he afterwards came to see me in prison, was pleased to regret that I had not stayed. He told me, that the sight of my volume at Harrow had been one of his incentives to write verses, and that he had the same passion for friendship which I had displayed in it. To my astonishment he quoted some of the lines, and would not hear me speak ill of them." "Shelley, when he died, was in his thirthieth year. His figure was slight, and his constitution consumptive. He was subject to violent spasmodic pains, which would sometimes force him to lie on the ground till they were over; but he had always a kind word to give to those about him, when his pangs allowed him to speak. In this organization as well as in some other respects, he resembled the German poet, Schiller. Though well-turned, his shoulders were bent a little, owing to premature thought and trouble. The same causes had touched his hair with gray; and though his habits of temperance and exercise gave him a remarkable degree of strength, is is not supposed that he could have lived many years." 3/2/1813 Leigh Hunt sentenced to two years of imprisonment. He had been found guilty of slander against the Prince-Regent. His brother John Hunt was convicted and sentenced as well. The grave of Leigh Hunt at Kensal Green Cemetery, London. "The Funeral of Shelley" by Louis �duard Fournier. E.J. Trelawny, Leigh Hunt and Lord Byron watch the burning of Shelley's body. 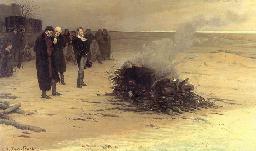 In reality Byron had left the scene before the burning took place.